The Costa del sol is on the Mediterranean coast and is part of Andalucia. Inland there are many quaint villages including the oldest bullring in Spain. 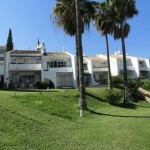 The area provides for every bodies interest including ramblers, horse riding, the gourmet, children and of course golfers. Malaga airport is only a short drive away. If we can start our tour from Torremolinos just outside of Malaga, this is a large seaside resort, more attractive to the very young. Long sandy beaches, busy night life and hundreds of hotels. Benalmadena is the next attractive resort with a massive harbour containing many harbour side restaurants and chic shopping. Well worth an evening visit, to eat and gaze on the hundreds of boats nestling in the most up-market of harbours. "Tivoli World" is a Mecca of children's entertainment, with rides for the young and not so young, including cable car ride up a small mountain. Tivoli World opening times vary from season to season... Please check first. Further on is the town of Fuengirola, which has fabulous beaches and nightclubs. The old town square with its surrounding cafes and shops is where you will meet the local Spanish. In Fuengirola is an aqua park where you can lounge around the various pools and let the children amuse themselves on the various water rides. There are small shops and a cafe in the complex. You can easily spend a day there. Go-Carting is a popular attraction for the kids near to the aqua park. As you move further along the coast towards your holiday apartment, there are many local beaches and a massive selection of restaurants, serving Indian, Chinese, Spanish and local cuisine. As you go on nearer to Marbella, there is Puerto Cabopino which is a chic harbour, surrounded by quality but reasonably priced restaurants. Next-door is "Andy's Beach", which offers sun loungers, restaurants and parking. We now come to Marbella which is one of the largest towns. Surrounded by shops, restaurants and beaches and a bullring it offers much for the whole family. Perhaps spot the movie/pop stars in their favorite night club! You must visit Puerto Banus in Marbella. This is an up-market harbour sheltering million pound yachts and surrounded by restaurants and shops. Again, it is the place to see the famous promenading. Just outside Marbella is the Safari Park Selwo. This is cross between a zoo and a Safari Park. A superb day out, with exciting Safari lorry rides around the edge of hilltops. But what about a day in Gibraltar for amazing bargains on Tobacco and alcohol? Visit the old town shops or the Barbary apes on the cliff tops. But do leave your car in Spain, and cross by foot. The wait to drive back to Spain can be seriously long! A daytrip to Africa can be easily arranged from many local tourist\travel agents. They will arrange a coach trip, Hovercraft crossing, day in Souk, lunch and the return trip. When last looked at, it was £30 per person. A long but very interesting day. Look for announcements on the local fiestas. These are frequent and can be individual to a town or village. They offer free entertainment and it gets you into the spirit of Spain. The English printed "Sur" newspaper is available free of charge at shops and Supermarkets on a Friday. It will list local news and entertainment. There is so much to be said for the area. Thousands of cheap restaurants and bars. Everybody speaks English. A myriad of beaches. Good weather virtually all year. You will never have to go far to be entertained. Many, many golf courses and driving ranges if that is your idea of a good holiday.